Veronica Connor Middle School District's Web Page. From right, top row: GI students Dominic Justus, Caity Kleinschmidt, Joe Cali, Nick Keller and Kenny Carter. Far left: Health teacher Carley Antonelli. Click photo for larger view. Nick Keller being interviewed by Play 60 crew. 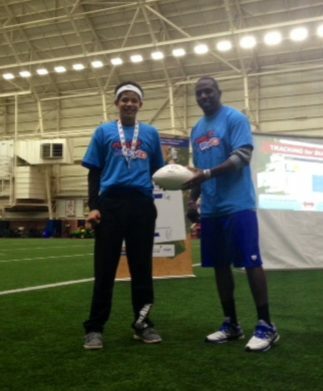 Eric Banks is awarded an autographed football from C.J. Spiller. Pictured front: Nick Keller Back: Emily Reynolds, Eric Banks, Dominic Justus, Maria Buscaglia, Kenny Carter, Sean Christian Rustowicz, Joe Cali. Congratulations to Carley Antonelli and the Physical Education Staff for receiving the NFL Play 60/Fuel Up to Play 60 Grant. 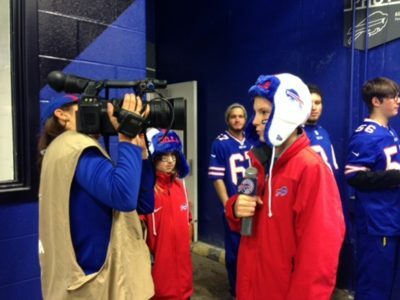 This grant is sponsored by the Buffalo Bills and the National Dairy Council. 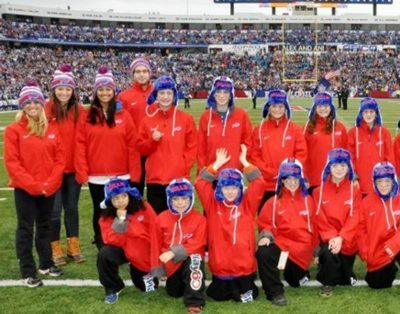 Veronica E. Connor Middle School students are on the road to wellness and at Sunday, November 30th Buffalo Bills game against the Cleveland Browns, students from VCMS were presented with a check in the amount of $5,000.00 for iPad mini's, dance instruction and various prizes for participating students. 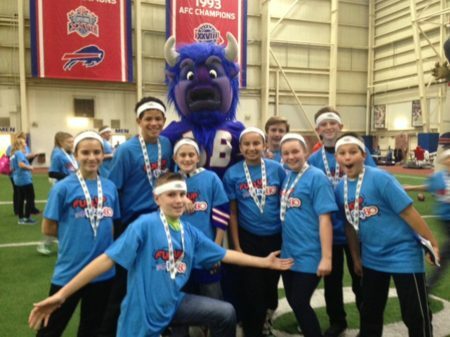 A group of students also attended the Fuel Up to Play 60 Forum at Ralph Wilson Stadium on Tuesday, December 9th. At the forum, 7th grade student Eric Banks was awarded an autographed football from C.J. Spiller. 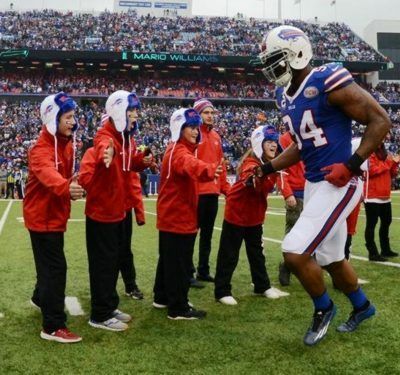 As an NFL Play 60 Ambassador, Eric earned more points than any other student on the Play 60 online dashboard. Students earn points by completing mini-lessons, tracking daily nutrition and physical activity habits, and completing acts of leadership within their school. Seventh grade health students in Mrs. Antonelli's class have been working in collaboration with Mrs. Anne Rich, Grand Island Schools Food Service Coordinator, to create and market the new Healthy Start Breakfast cart. Students can purchase healthy foods to start their day as a combo or a la carte. Fresh fruit can be purchased to enjoy during healthy snacking mods 3 and 10. The Healthy Start Cart is one of the "Nutrition Plays" that students selected from the Fuel Up to Play 60 "Play Book" to employ this year. Middle schoolers also had an opportunity to advocate for "Physical Activity Plays" which are physical activities they wanted to see incorporated into the curriculum. Dance and Flag Football were decisively popular. The middle school Physical Education Department also received a mini-grant from Play 60. 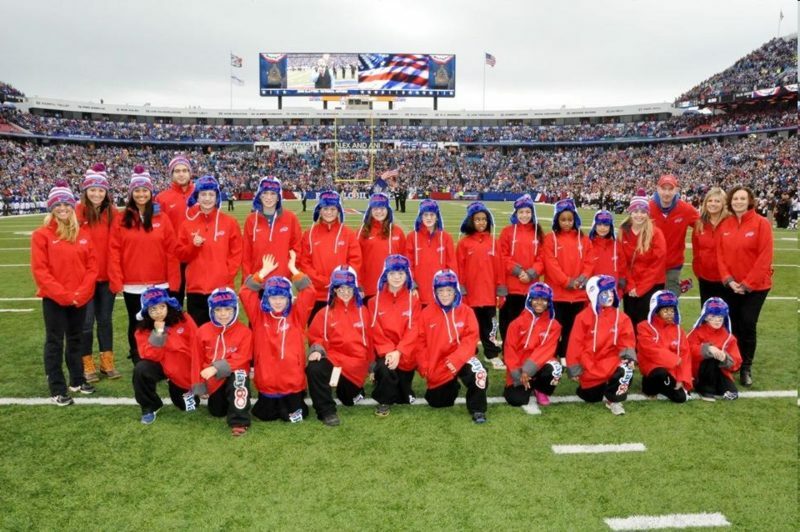 The Physical Education Department received flags, and footballs this past October. Flag football is offered as a unit of study and over 30 students now participate in Flag Football intramurals on Tuesday and Thursday mornings, with Mr. Johnston and Mr. Carney. Dance opportunities kicked off at Connor Family Fun Night on November 14th with dancing led by Mrs. Antonelli and Mrs. Barnes. At least 30 families participated in a vigorous three hours of dance. MS Parent Teacher Conferences being held on Monday, December 1st in the Middle School from 12-3:00 p.m. and 4:00-7 p.m. There is a guest speaker, Kathy Gust, at 3:00 in the Little Theater speaking on Social Media and Internet Safety. Prepaid orders are being taken for the PTA Poinsettia/Wreath Sale until Friday, November 14th. Fill out the form with your order, return to middle school with check made out to Middle School PTA. 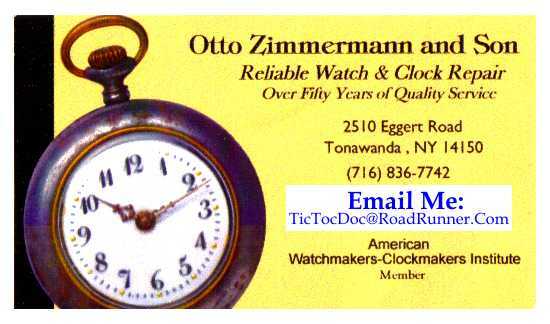 Contact Betsy Cali for large orders or questions at 725-8939. 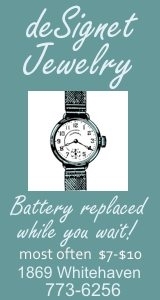 Orders must be picked up Monday, December 1, 2014 from 11:00 a.m. - 7:00 p.m. in the high school Viking Mall. Order form. Veronica Connor Middle School will be holding their annual Connor Family Fun Night on Friday, November 14, 2014, from 6:00 p.m. - 9:00 p.m. Admission is free and the public is welcome to attend. There will be a variety of activities for everyone to enjoy. In the cafeteria you can sample foods and play an assortment of games, for a small cost. The PTA book fair will be located in the cafeteria, with many outstanding books. The highly anticipated Cake Walk will take place. The Cake Walk is similar to musical chairs in which students dance around a circle. When the music stops, each person chooses a movie character to stand on, at that time a name is pulled out of a bowl and the character picked is the winner! The kids love it! At the end of the evening many theme baskets and a 32" LED TV will be raffled. The Veronica Connor Middle School Open House is Tuesday, September 16th, 2014 from 6:00-8:00pm. This is an evening planned for adults only. Parents and guardians will have the opportunity to follow their child's "Day 1" schedule, meet classroom teachers and view the school facilities. Please be sure to obtain the room number of your child's first class; report to that room at 6:00 p.m. You will receive a copy of your child's schedule at that time. The front parking lot fills quickly; there is additional parking behind the high school. The PTA will serve refreshments in the cafeteria. VCMS sportswear will be available for purchase. 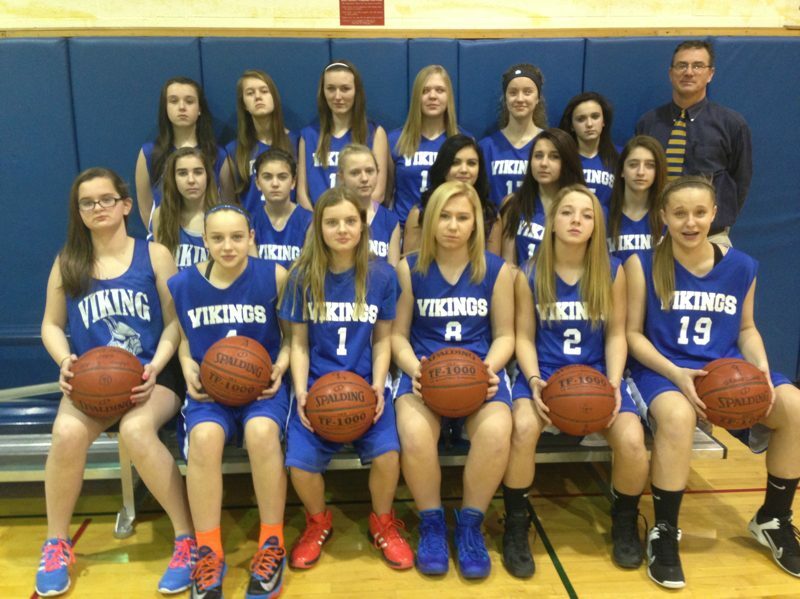 The 2014 lovely Lady Vikings of the Niagara Frontier League posted a perfect 14 and 0 record. This gives the nine second-year players a 27-game win streak (including 2013) as they move on to the high school. They are a dominant squad with which to reckon, averaging 17 runs per game while allowing less than four. The seven seventh graders contributed greatly to this season's success. Jenna Gleave and Bridget Neeson continue to work on their skills and will be important pitchers in the future. Both girls batted near .500 and much will be expected of them in 2015. Alexa Chiarenza played very well in the field and is quietly learning the art of batting left-handed. Savannah Sipe was an imposing force at third base, gobbling up grounders and batting almost .600 with 15 RBIs. Player/manager Hannah Cool contributed quite a bit. She was solid in the field and good things are expected from her next season. And finally, assistant captain Alison Schoener. Schoener led the team in most offensive categories: 20 hits, 24 stolen bases, six triples, an almost .600 batting average (BA), and 14 RBIs from the leadoff slot. Her defensive play was stellar, but her finest work may have been in the few innings she spent in the third base coach's box. Alison knows how to keep a team on an even keel - focused, yet fun. Schoener is a big help towards any goal. And, of course, the eighth graders... there were 12 of them - a large and talented group. The three pitchers were the difference in the season. Without pitching, quality fast-pitch softball cannot be played and, unfortunately for the rest of the NFL, we had the three best pitchers by far. Marissa Hovey (season MVP: 35 K in 19 innings, 0.37 ERA, nearly .700 BA), Hallie Mingoia (seven runs in four wins, 17 RBI, .571 BA), and Megan Stanley (captain, 35 K in 20 innings, three wins, on base percentage [OB%] of .667) may have been able to go it alone some innings because they were so dominating. Each pitcher was very supportive of the others, creating a healthy competition to be the best each could be for the greater good of the group - a rare commodity in an age of "me". Megan's captaincy was perfect – a leader (striped pants), an organizer (striped pants), and unassuming (striped pants); Mingoia was a welcomed addition who led the team in doubles (five) and found a love for catching (is it too late?! ); and Marissa Hovey - a quiet performer that can easily be overlooked until you total the numbers. Two newcomers in eighth grade were Madison Ciraolo and Nicole Hoy. Madison was a disciplined leftfielder and tied for the team lead in walks. Nicole played a solid first base and hit with authority while posting her .556 BA - she was a pleasure to have on the squad after her success during the basketball season. Returners included Emily Cordero, Alyssa Ruminski, Katelyn Simpson, and Jenna Tavano - all part of the 27-game win streak. Emily was another solid "firstbaseperson" who tied for the team lead in walks. Combined with her .619 BA, Emily was second on the team in OB% at .758. Alyssa was having her usual strong season until being sidelined with an injury. She ended with a respectable .429 BA and will be a help on JV next year. Katelyn also had an injury-shortened season, but it was at the front end. When she returned, Katelyn posted a .462 BA and also played a very good first base. Jenna usually played second base, but "got in the circle" for a few innings to relive past little league glory days. She had a few successful frames there and hit the ball hard over the course of the season (.483 BA). As important as pitching is, much of it doesn't happen without catchers and your lovely Lady Vikings had the two best in the league - Jen Faso and Grace Federico. They each missed time due to injury, but thankfully there was no overlap (no real worries - rookie catcher Mingoia was waiting in the wings to get behind the mask full-time). Faso only played half of the season and, if one were to prorate her numbers, she would have led the team in many offensive categories. As it is, her .529 BA and ten RBIs were respectable for most full season stats. Federico had five extra-base hits, including the only homer of the season, while posting a .538 BA. Both catchers are aware of their surroundings and enjoy picking off careless base runners or throwing out potential base stealers. And finally, the season might not have been the success it was if not for the work of player/assistant coach Chloe McQuestion. Chloe would have made the JV team if not for a season-ending injury and is not one for sitting around. Needing to be around the game, she jumped into the position of assistant coach. She was at every practice to urge the players on and became well-versed in the scorebook. All of the patience was rewarded in a doubleheader on the final day of the season. She took the field and was her classic self - responsible in the field, one for one with an RBI, two walks, and a stolen base. It was a pleasure for all to see her back where she belongs, on the other side of the white lines. JV will be very strong next season with the addition of this year's crop of talent. This team was a joy to work with and watch play. We are all looking forward to great things in the upcoming high school years, both on and off the field. Best of luck to Katelyn Simpson and Chloe McQuestion who, over four modified seasons (two basketball and two softball), were part of four teams that posted an incomparable 53 and 3 record with four first place finishes (one a tie). Those gaudy numbers are rarely matched and are a testimony to their competitive spirit. Go girls! Parents/Guardians of current 5th grade students, who anticipate their children will be attending Connor Middle School next year, are invited to an orientation program on Wednesday, June 11th at 6:00 p.m. in the Middle School Little Theater followed by a tour of the building. The orientation is for parents only and will last approximately an hour and a half. Please call 773-8830 if you have any questions about this event. 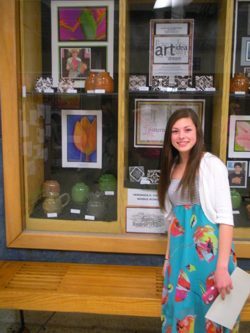 With hundreds of students, their families, teachers and staff in attendance, the Art Department of the Grand Island Schools presented their 16th annual District-wide art exhibit beginning with an opening reception on the evening of May 19th. Artworks by students enrolled in each of the district's five schools displayed artworks which visually tell stories, record and explore the world, solve visual problems and express the students' unique ideas. Work in a wide variety of media including paint, pencil, ceramics, photography, collage and mixed-media was on display. Students frequently use the visual arts an appropriate vehicle for self-expression; art making serving as a healthy, creative outlet for their varied ideas and individual point of view. The public is cordially invited to view the show which will remain on view through May 23rd. 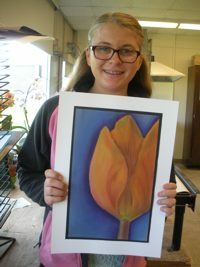 Works by hundreds of student artists will be on display in the Viking Mall of Grand Island High School as the Art Department of the Grand Island Schools presents their annual district-wide art show. Students in grades K-12 have eagerly been preparing works in anticipation of the yearly event. Designed to showcase student achievement and the ways in which district students are meeting the rigorous NYS Art Standards for the Visual Arts in their classes, the show will open with a reception for artists and their families on the evening of May 19th from 6:30-8:00 p.m. The public is cordially invited to view the students’ work and to share in their teachers’ and families’ collective pride as they view the unique artistic points of view, creative solutions, visual problem-solving and individual artistic voices on display. 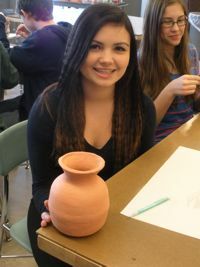 Mariana Floro with her ceramic pot. 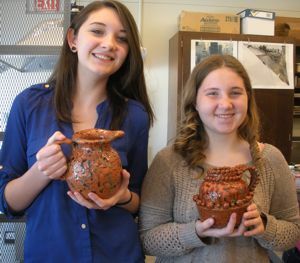 Katie Gibbons and Megan Urbaniak show their latest ceramic creations. The work of 39 Veronica Connor Middle School students can currently be seen in the Community Meeting Room of the Grand Island Public Library during regular library hours. The show celebrates the talents of middle school students and highlights the learning taking place through the visual arts at the school. Work in a wide variety of visual media display the ways in which students use art as a language, reacting and engaging with the world around them. Pastel paintings, pen and ink, graphite and watercolor paintings are among those pieces featured. 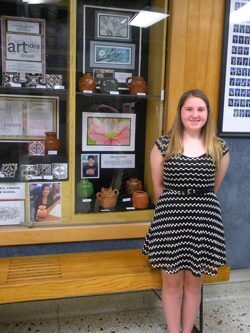 The display is an annual undertaking for students at VCMS, in honor of Youth In Art Month. The annual observance began nationwide in 1961 as a collaborative effort between the Art and Craft Materials Institute, the National Art Education Association and the Council for Art Education in order to emphasize and make known the value of art education for all students and to support quality art programs within the nation’s schools. Students at Connor Middle School join thousands of other students across the US in participating in activities to mark the occasion. Among its many goals, Youth In Art Month seeks to direct attention to the value of art education as an important component of the total student experience and educational curricula within schools. Recognizing that art education fosters understanding which helps develop citizens of a global society, Youth In Art Month seeks to make communities aware of the divergent and critical thinking skills inherent in art-based learning. Student participants; all grade 8: Claire Beecher, Cameron Blair, Claire Brandon, Eva Bobeck, Ryan Buzby, Giona Cafarella, Lauren Chadwick, Madison Ciraolo, McKenna Davis, Julianna DeSimone, Daniel Fabiano, Jessica Faso, Mariana Floro, Hailey Geyer, James Grinchishin, Josh Hannibal, Sydney Hoerner, Nicole Hoy, Madeleine HusVar, Ryan Kernin, Katie Kuch, Tess Lariviere, Matthew Logel, Alyssa Luzak, Kyra Magee, Gianna Novelli, Natalie O’Brien, Kate Riniolo, Alyssa Ruminski, Josh Schaeffer, Kayla Staub, Breanna Stedman-Pate, Dominic Tagliarino, Andrew Thompson, Gracie Tompkins, Anna Ungaro, John Vandermey. The Grand Island Community is cordially invited to view the students’ work which will remain on display throughout the month of March. Veronica Connor grade eight student Cameron Blair, has been selected as the K-12 Artist of the Month for February, 2014. 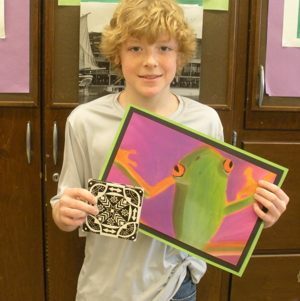 Cameron is pictured with two of his most recent artworks. Cameron is a strong and meticulous art student who displays an exceptional eye for detail and is very creative. He thoughtfully engages each project and displays an ability to think outside the box. He is always eager to experiment with new techniques and media and displays success in all he attempts. 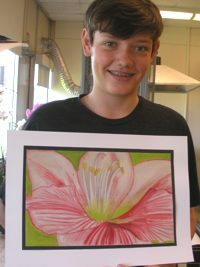 One of his pieces has been selected for the Youth In Art Month display at the Grand Island Public Library. Cameron's interest in design extends beyond the art room. He displays an interest in technology and would one day like to combine his art and technology interests by pursuing a career that allows him to draw and create new concept cars. He is a well-rounded student who excels academically as well. The Art Department of the Grand Island Schools is proud to recognize this student's exceptional artistic achievements and unique creative voice by honoring him with this special designation. Your lovely Lady Vikings of Connor Middle School posted a beautiful season in 2014, going 14 and one and tying for first place in the Niagara Frontier League. The girls averaged 33 points per game while allowing a measly 18 per contest. The season included two non-league games against cross-town rival St. Stephen's, which were hard-fought on both sides and fun for all who participated. Seventh graders who comprised this year's skilled squad included Riann Colan and Bethany Wolcott. These two players put forth solid efforts on defense and showed a bit of a scoring touch. They are looking forward to the 2015 season. Emma Mahoney missed a portion of this season due to injury, but showed herself to be solid rebounder with a soft shot - she put in 28 points. Alexa Chiarenza earned more and more playing time as the season progressed, proving her value in tight situations. She was an excellent defender who did not give an inch to the opposition. Alexa put in 31 and will be an important cog next year. Emma Halpin had a knack for a finding some open space to launch her smooth jumper and finished with 23. She, too, will be counted upon in 2015. And finally, Assistant Captain Jordan Pachla, Jordan had 35 on the season, but, more importantly, ran a very controlled offense. Jordan could dribble around a pressing defender or find the open teammate for the easy shot. Jordan's leadership will help guide the team during the 2015 campaign. Of the 10 eighth graders this season, only three were returners. The seven "newbies" brought a wonderful and welcomed mix of height, shooting, and tenacity that usually takes a season to develop. Carly Sozio and Mariana Floro played a smothering, deny defense that often left their "dance partners" wishing for another matchup. They played with heart and never took a possession off. Emma Richard, Alicia Haak, and Nicole Hoy provided height matchup problems for every team Grand Island faced. Together these girls put in about 50 points, almost all on offensive put backs. They were just difficult to box out and as time goes on will be a big plus to the basketball program in the high school. As the saying goes, you cannot teach what they have. Gracie Tompkins was good for 44 points and truly could have doubled that if she wanted. Gracie's ability to make layups from either side is a coach's dream. She has worked hard at it and it now looks effortless. It is a lesson for all players of any age. Her layups often overshadowed her smooth jumper, which made her a threat inside and outside. Sarah Bykowicz joined the gang this year after much success in the JV soccer net. The basketball program needs her to stick with it as she doubled the previous assist record with her long lead passes for easy GI layups. Sarah's tremendous peripheral vision, anticipation, and quick hands made her the best defender in years, once she had the ball it went down the court as a long pass and became two for us. The following three were the only returners from 2013 who could show everyone how it's done. Karolina Woodward was another height matchup issue for the defense and her touch and awareness under the basket was unmatched, hence her 26 points. Under the boards (and sometimes at the point!) was another tenacious defender - Co-Captain Katelyn Simpson. Katelyn was not to be toyed with - loose balls and stray shots were hers on the defensive side. Katelyn put in 40 on the year, did not back down on the court, and was always out in the final minutes to help lead the team to the finish. And finally, player-wise, the other Co-Captain was Chloe McQuestion. Chloe was the most valuable player on a team of valuable players. She didn't give an inch on defense, left every ounce she had on the court, and finished all of Bykowicz' lead passes with uncontested layups. Chloe scored on jumpers; Chloe scored driving the lane. Chloe ran a well-executed, sharing offense from the point and still posted 139 points for herself. 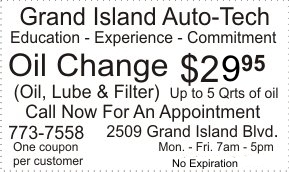 This ranks as the second highest single-season scoring total in two decades of Grand Island Girls' Modified Basketball. McQuestion and Simpson were two leaders who led by example and led their team to a dominating season in 2014. The future of GI girls' basketball looks very bright with this group of eighth graders ready to go up and do their part for our collective pride. Not to go without mention were two outstanding additions to this year's program: scorekeepers/managers/forwards Sydney Dworak and Bridget Neeson. These girls came to practices and games and made the team better through their efforts. Both girls also saw playing time ~ Sydney went to the line and Bridget scored on a fabulous feed from McQuestion. Parents and fans brought life to the contests and the scorer's table was run well by Nancy Keller. JV and modified programs look to improve upon this year's success and the rest of the NFL should be wary in 2015!